There is nothing better than diving into warm cinnamon rolls straight from the oven. Drizzle them with a light glaze and anticipate the center filled with sweet goodness … OH MY! And the aroma that fills the house while baking these makes us want them even more. Add a comfy and cozy cup of coffee to savor along with this delight, and this breakfast/brunch is over-the-top FABULOUS. I have been working on creating a healthier version and have come up with cinnamon rolls that I will bake again and again. For this recipe, my focus was to create healthier dough. So, I eliminated all eggs, butter, and white flour, typical ingredients for cinnamon rolls. Since I could not really change the ingredients used in the center filling, I reduced the sugar and used real butter. 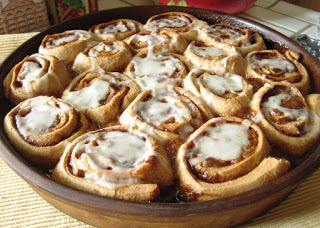 The result: soft, absolutely delicious and flavor filled healthy cinnamon rolls perfect for breakfast, brunch or anytime! Note: Allow 2 hours which includes preparing the dough and bake time. In order to prepare the dough, I used my Electric Mixer with a dough hook . Combine 2½ cups flour, undissolved yeast and salt in a large bowl. In a separate bowl, heat water, almond milk, coconut oil, and honey until very warm (120 to 130 degrees). I just heated in the microwave until very warm, not hot. Gradually add to the flour mixture, beat 2 minutes at medium speed of electric mixer with dough hook, scraping the bowl occasionally. Add 1 cup of flour, beat 2 minutes at high speed, scraping bowl occasionally. If the dough pulls away from the sides, and forms a ball, it is ready to remove and put onto floured surface to hand knead. If not ready, mix in just enough flour to make soft dough that forms a ball (I did not use all my flour). Knead on lightly floured surface until smooth and elastic, about 6-8 minutes. Cover the dough and let rest on floured surface for 10 minutes. Roll the dough into a large rectangle at least 15” by 11”. Rub soft butter until dough is well coated. Sprinkle with brown sugar and spices. Roll up rectangle tightly, starting with a long edge, pressing firmly to eliminate air pockets; pinch seam to seal at ends. Cut the dough into 16 rolls. Place the rolls, cut sides up, in a large round baking dish (I used an 11 inch round stoneware) or feel free to use a 13 x 9-inch baking pan coated with cooking spray. Cover and let rise 45 minutes or until doubled in size. Preheat oven to 350°. Uncover rolls. Bake at 350° for 20 minutes or until lightly browned. Prepare the glaze by placing powdered sugar and vanilla in a small bowl. Add 5 teaspoons almond milk, 1 teaspoon at a time, stirring to form a thick glaze. Drizzle glaze evenly over warm rolls.